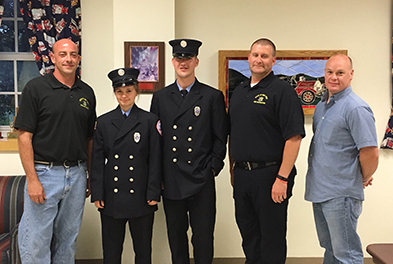 Tech Valley High School incoming senior Samantha Pierce, second from left, received certification this summer in the NYS Firefighter I course of the standardized fire training program. Tech Valley High School is proud to announce that senior Samantha Pierce received certification this summer in the New York State Firefighter 1 course of the standardized fire training program. She is a volunteer firefighter with the Schoharie Fire Department. To achieve this, Pierce had to undergo extensive training that she will continue in order to help keep her skills sharp. In this Q&A, Pierce talks about the certification process, and the drive she has to help keep her community safe. You graduated Firefighter 1 in July. What does that mean? Pierce: Graduating this class means that I am better able to uphold the oath I took to protect and serve my community. I am better trained in hazardous materials, fire protection and suppression, and scene safety. What did you have to do to reach that achievement? Pierce: This class was 104 hours long, not including outside skill training. There were a lot of things I had to do, some harder than others. There was some lecture sessions and a lot of skill sessions. Skills consisted of tying knots, victim searches and carries, ladder skills, forcible entry, and my favorite — vehicle and structure fire suppression, to name a few. What does this certification mean for you in your goal to become a firefighter? Are there more courses? Pierce: This is the most basic firefighter certification. By taking this class, I have learned I have a passion for knots and rescues. I plan on taking more courses on ropes and knots and search and rescue. There is a saying in the fire service “the day you stop training, is the day you retire”. What has this certification enabled you to do since you got it? Has it allowed you to do more during incident response? Pierce: About a month and a half after receiving this certification, my department was called to a working structure fire. The truck I was on only had three people on it, enough for a truck operator and an attack team. My assistant chief and I geared up and went inside. We were able to contain the fire to the dryer and extinguish it. I’ve been to many other calls since then, but this was the most memorable as it was my first time inside an actual fire. I now know a lot more and feel comfortable doing more on emergency scenes. When did you first become a firefighter? Pierce: Well, I like to say I was born in bunker pants. I was raised in the fire house. I loved hearing the sirens and seeing the bright lights. There is a lot more to firefighting and emergency medical services besides the things that people see. A large part of it is preparing for emergencies, big and small. I first became an explorer when I was 14. I wasn’t able to do much, except train. But when I turned 16 in October of 2015, I joined my volunteer department that my father is the chief of. Pierce: There is more to firefighting than putting water on fire, there is a whole science behind it. Also, it’s not always a glorious and heroic job. There is a lot of hard work and time spent training for emergencies. Also, you should pull over for blue lights. Not because it’s a law, but because it’s courteous and you don’t know where we are going and what we are trying to save.